Draw a crowd to your next event in the California Capital with the Sacramento Poster. The design features plenty of room for your event details, with the beautiful gold lights of the skyline and Tower Bridge reflected in the serene river. 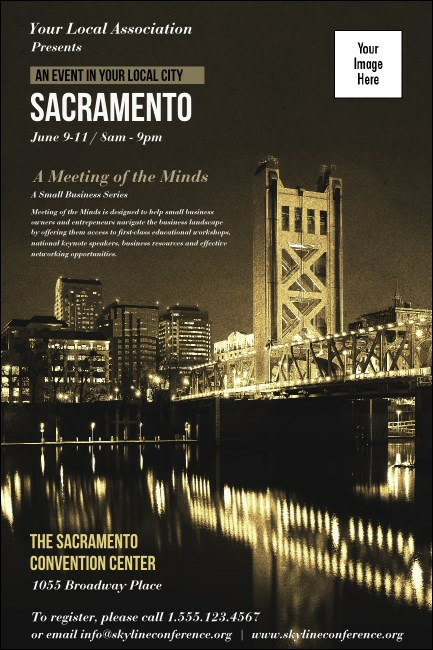 Whether you're hosting a conference, concert, or fundraiser, promote it with this elegant Sacramento Poster. Combine with a Sacramento Event Kit from TicketPrinting.com for a unified look!